Charles Guerin original lithograph "Jeune femme a la balustrade"
Medium: original lithograph. 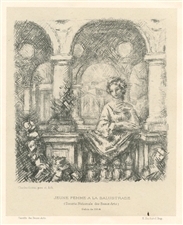 Printed on chine-colle paper by E. Duchatel and published in Paris in 1914 for Gazette des Beaux-Arts. The catalogue reference is Sanchez and Seydoux 1914-4. The image measures 7 1/2 x 6 inches (190 x 155 mm). The total sheet is 10 1/2 x 6 1/2 inches (265 x 170 mm). Not signed. Condition: there is a small black spot above the printer's inscription near the bottom edge of the china paper.